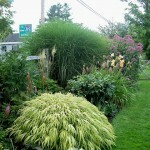 Let’s use some of the big ideas I have talked about in other posts to make a Naturalistic Front Yard landscape design. I have done front yard designs before, including one last year for my old little neglected ranch house. While I did mix it up a bit with some more interesting plant choices than the typical landscaper might use (no spireas in that design thank goodness), I admit it is still pretty shall we say “landscapy”. What do I mean by Landscapy? This design will be quite a bit different than that one above. In today’s design, lets make a design that says Screw Neighborhood Convention, let’s make something more Naturalistic and interesting. Your neighbor may have to look at it when they walk their dog. However, you are the one that is going to be living in it. So design a yard you want. Maybe one that is less about having the greenest grass (i.e. most toxic site in neighborhood) but instead about having the most flying flowers (butterflies). The term “naturalistic design” can bring lots of things to mind from Japanese gardens to Piet Oudolf style plantings to prairie restorations depending upon who you talk to. In today’s design, we will mean more of a loose, native plant driven design that is inspired by the feeling of the prairie. This is by no means an attempt of a design based on that ecosystem, which can be wonderful but doesn’t usually show as well on a landscape plan. This is a design for someone who likes a designed space but wants a naturalistic feel. The first big idea is that we ditched the idea of showing off the house from the street. We instead enclosed the front yard with a hedge and planting to make it more private for the home owners. It is not completely sealed off, the drive is still open and the plantings at the front are more open and tranparent. We did however enhance the privacy of the front yard by enclosing it. 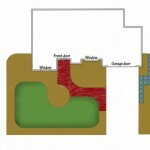 While this is commonly done in back yards, it is less commonly done it front yards. We used native plants including Arrowwood viburnum, Blackhaw viburnum, Serviceberry, Black Hills Spruce and Switch grass. You can read more about this idea in my post on Enclose your garden to create a sanctuary as well as Mixed borders for enclosure. Instead of having most of the front yard default be grass with a tree in the middle of it and some planting beds wrapping around the foundation of the house, let’s ditch the grass and make most of the yard plantings. Why would we want to do this? 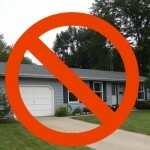 Read my post on Tyranny of the turf or if you want some alternatives Replace your lawn with? So what are we going to replace what we would normally have turf covering? How about some simple plant combinations. Most of these are prairie plants that grow well together. While Group #4 is a combination I have seen used by Roy Diblik and blends nicely at the front of these other plantings. I first wrote about this idea in my post on Simple Plant combos. I also put several of my favorite prairie and ornamental grass, prairie dropseed (Sporobolus heterolepis) at the front of this planting as well as throughout the landscape as a key design element to tie it together. 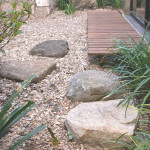 Granite boulders are set within the plantings to add more four season interest. 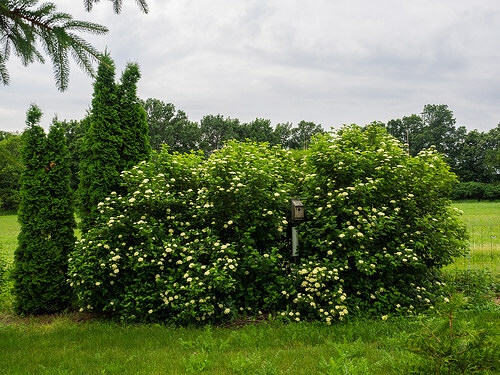 The plantings are also set off with a background hedge of Arrowwood viburnum. Note I included a strip of turf grass along the walkway between these plantings and the walkway. This creates a buffer and provides a neat orderly frame around this planting. This simple idea has been found to make wilder prairie style planting much more acceptable aesthetically. This is like putting a frame around a picture. Plus it keeps plants from falling over onto the walking path. A split rail fence and some more turf at the front of the yard also help to create this orderly frame. This can make a huge positive impact on how others perceive your naturalistic front yard. 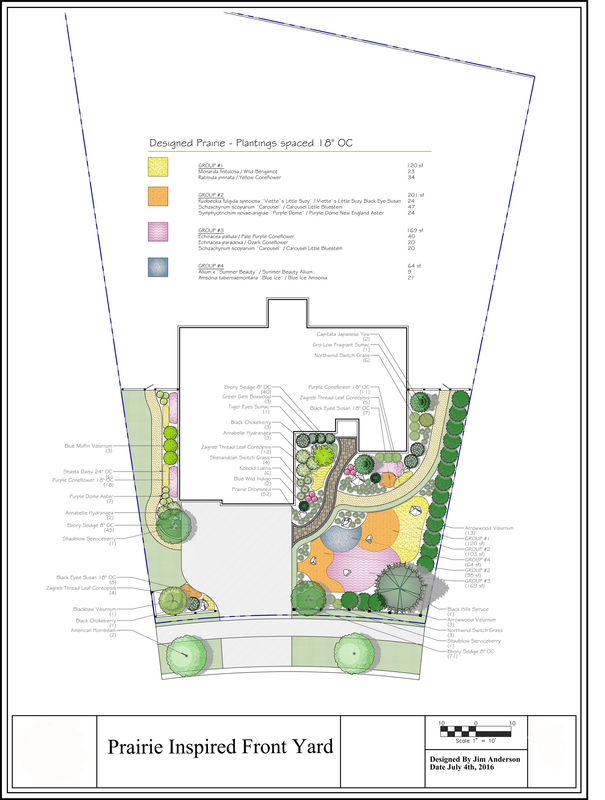 No Burning bush, Ornamental Pears, or Pachysandra in this plan. OK, I admit it. I couldn’t totally get rid of them. I have three Green gem boxwood and one two Japanese yews in this plan. 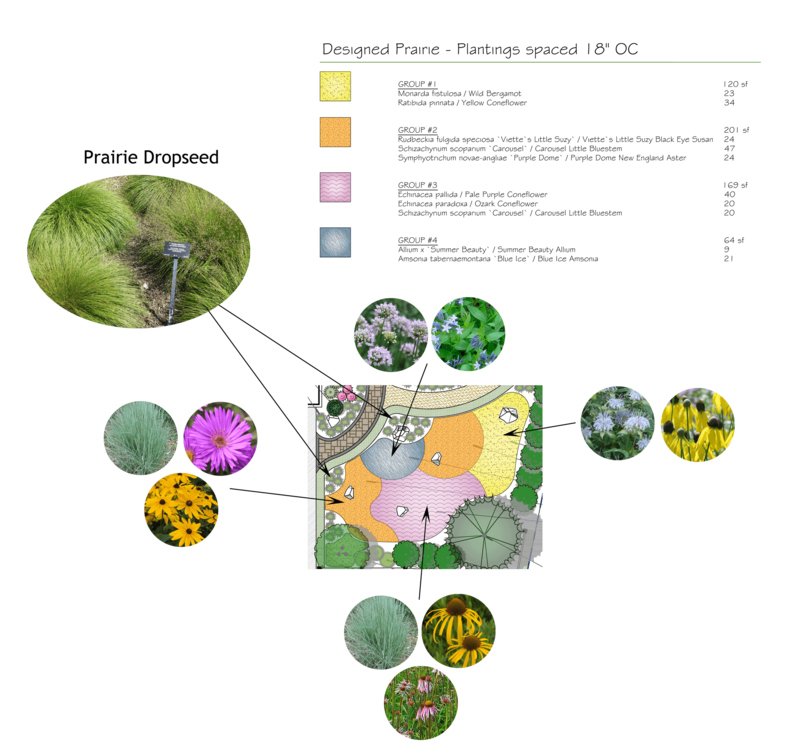 There are five definite non native plants in this plan. The other 605 are natives of the US, cultivars of native, or hybrids of natives. 99% of this plan is plants native to the US. Certainly some like the Black Hills Spruce are not from my ecological area but most are. The Serviceberry, Blackhaw viburnum, American Hornbeam trees are all local to my county and they are all great wildlife and landscape plants. 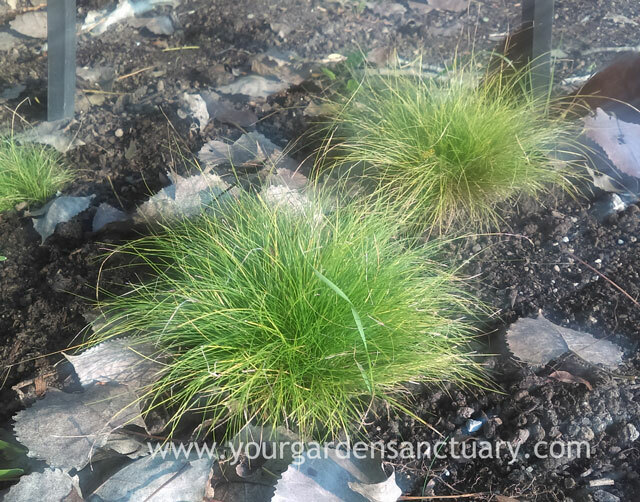 Besides using the prairie inspired plant combinations and lots of prairie dropseed to cover the ground instead of turf, we will add another plant to help cover the soil. Typically, landscapers might suggest Vinca or Pachysandra to cover ground, make a uniform understory and help suppress weeds. How about a sedge instead? Maybe you have heard of Penn sedge (Carex pensylvanica)? I did use it in that design I talked about at the beginning of this post. But I bet you have not heard of Ebony Sedge or as it’s more commonly known as Ivory Sedge. Confused?, lets just call it Carex eburnea. What Carex eburnea is, is an awesome drought and shade tolerant fuzzy little groundcover that I discovered at a native plant sale this Spring. It was so cute I had to buy three little plugs not knowing anything about it. Now I can’t walk by them in my yard and not pet them like they are my little pets. You will have less money and time sucking turf to maintain. 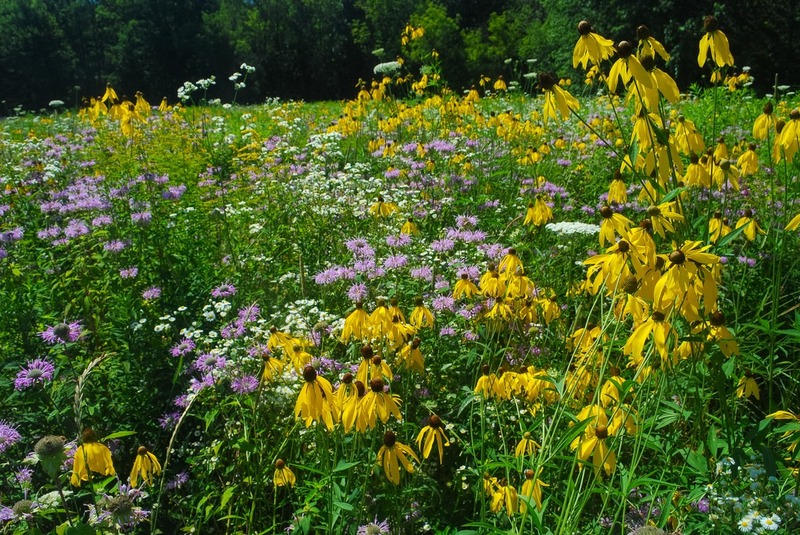 Your yard would be filled with native plants that attract and support wildlife biodiversity. Last but not least, you would have a private naturalistic front yard that would be a restorative space that welcomes you home each day. Jim this is absolutely beautiful. I can’t wait to see your home in a few years! I probably would have gotten rid of all the grass and planted the parkway area too, but something about weeding in dog urine soaked plantings (that’s all my dog ever does to any plants near a sidewalk) does not appeal to me. I find these kind of posts very interesting! I notice a lot of viburnum in thus plan, which is wonderful. However, I’ve been hearing about some newer problems with viburnums, some kind of pest, I believe. Do you know of it and is the type of plant you have here susceptible? Thanks. Yep. Pretty much all the viburnums are susceptible to some degree to the viburnum leaf beetle. There are controls available but encouraging beneficial insects such as ladybird beetles that eat the beetles by planting diverse plants may be the most sustainable. Insectidal soaps and other controls that don’t kill off your beneficial insects are definitely preferred. See this for more info on this new invasive pest. WOW ! These are beautiful landscape images and lovely landscaping ideas. Its a treat to watch them and getting ideas from them is an added advantage.